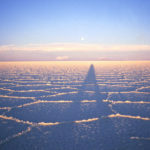 The Salar de Uyuni is the biggest and higher salt lake in the world; 10.000 square kilometers of salt crust, sometimes more than ten meters thick, at an altitude of 3.700 meters. 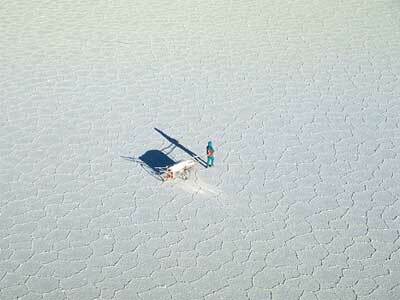 It’s situated in the southwest part of Bolivia, almost on the boarder of Chile. No person had ever crossed it on foot and alone. 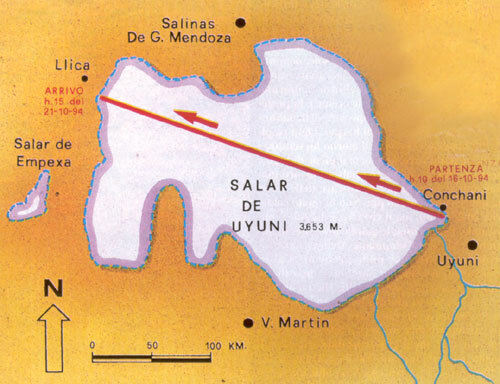 The people who live there are intimidated by the “eyes of the Salar”, that according to Inca legend, swallow the caravans that try to cross there. 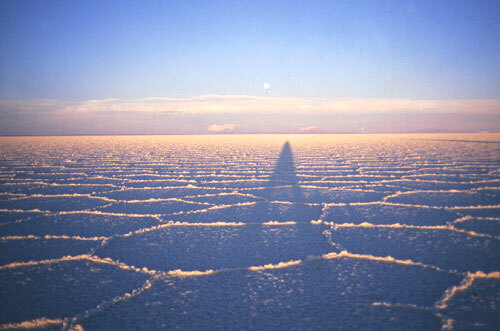 In reality they are holes on the top of the salt where the water comes out and they are almost invisible during the day because of the reflection of light. 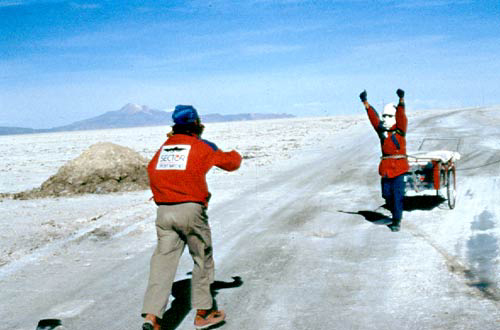 Carla decided to try the crossing alone and without any radio assistance. 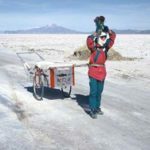 To be able to carry all the necessary equipment a trolley was made of ultra light material and mounted on three mountain bike wheels. She had to pull it with a strap connected to two rails to her waist and weighting 130 kilograms when fully load. 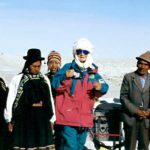 She left from a small place on the border of the Salar called Colchani on October the 16th and arrived, six days and 180 kilometers later, walking in an east-west direction, at Llica located on the opposite side of the lake. 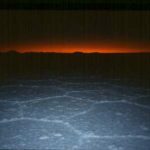 The enormous temperature change (25 degrees in the day and -20 degrease at night), the dry environment and the very strong icy wind that constantly hits the Salar, took Carla’s body to the extreme. 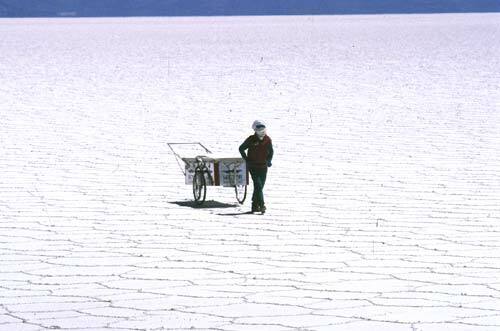 She had to sleep every night inside of the trolley after emptied out: fully dressed she slide inside her shelter and closed the drape that covered it, with the terrible wind hitting the only object that’s find for hundreds of kilometers, making it shake terribly. 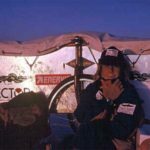 The combined action of sun, altitude, salt and wind quickly reached Carla’s skin, making it full of cuts, abrasions and covering her lips with fever blisters. 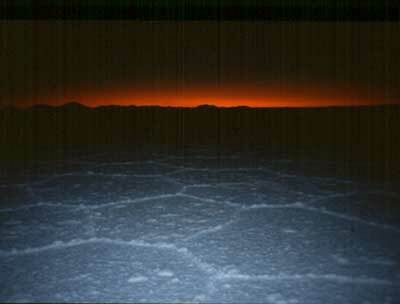 Even her eyes, which are protected by two pairs of sunglasses, started suffering from conjunctivitis. 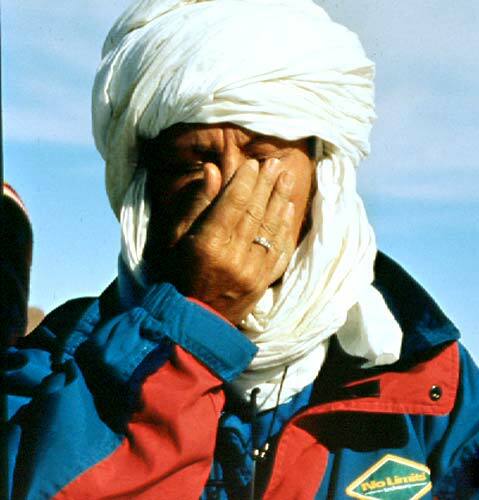 Every centimeter of her body was protected and the white Tuareg turbant was a life saver, but nothing combats the terrible Salar environment. 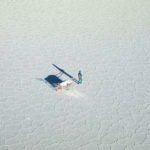 To travel in the right direction Carla used a GPS, the most known satellite tracking device; on the fourth day her husband, with a small plane, flew over her for few minutes to gather some pictures from above and to check how much she had already accomplished; the turbulence on the lake is very dangerous and the plane had to keep a certain distance to not get swallowed by it. The water consumption is a lot less than that of the Tenere and I don’t go over four litters daily. 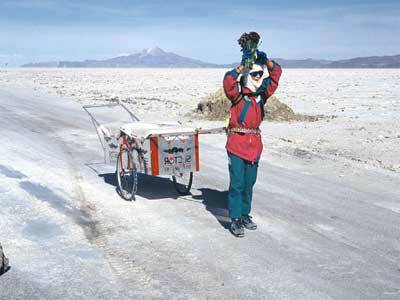 Carla set up a walking program to stop shortly every hour to check the direction and eat some power bars. Around noon she stops for an hour and a half: She was almost never hungry and the only food that she felt like eating was soup with fresh garlic and hot pepper and a little Italian cheese. Around five P.M the wind would start to blow again and she was forced to stop, make camp before dark and tie everything down to not lose anything. Any small distraction could cause a disaster. 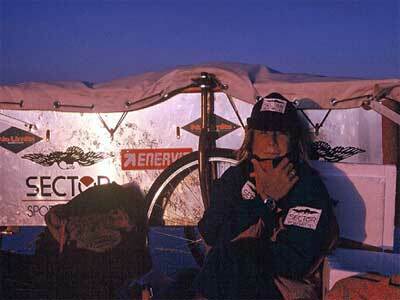 During the entire trip she didn’t encountered any living things and just two hours from the arrival, she saw a fly. 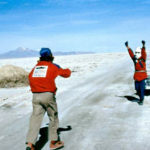 At Llica, with her husband and the off road vehicle driver, there was a small crowd of people anxious to meet the woman that alone had challenged the Salar. 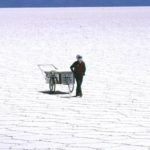 A small lady went close to her and asked in Spanish “What have you done so terrible to your husband to make you cross the Salar de Uyuni?”.